Boles, Glen and Erin James-abra. "Kicking Horse Pass". The Canadian Encyclopedia, 21 January 2019, Historica Canada. https://www.thecanadianencyclopedia.ca/en/article/kicking-horse-pass. Accessed 20 April 2019. Kicking Horse Pass is a route through the Rocky Mountains. At an elevation of 1,627 m, Kicking Horse Pass straddles the Continental Divide on the border between Alberta and British Columbia in Yoho National Park. In 1971, Kicking Horse Pass was designated a National Historic Site for its importance as a transportation corridor in Western Canada, first for Indigenous peoples, then the Canadian Pacific Railway, and finally the Trans-Canada Highway. Kicking Horse Pass was used primarily by the Ktunaxa (Kootenay) as a seasonal route to the plains on the eastern side of the Rocky Mountains. While other routes existed to the south of the park, these southern passages put the Ktunaxa in contact with the Siksikaitsitapi (Blackfoot Confederacy), with whom they were not friendly. Instead, the Ktunaxa likely used Kicking Horse Pass to access the plains, where they hunted bison on the territory of their allies, the Cree and the Stoney-Nakoda, and traded ochre with them. In the Kicking Horse Pass, BC (Corel Professional Photos). In 1858, James Hector, a Scottish geologist travelling with the Palliser Expedition, became the first European to encounter Kicking Horse Pass. It’s said Hector’s horse kicked him in the chest at this juncture, hence the name of the pass. Later, the Canadian Pacific Railway used the corridor to connect British Columbia	to the rest of the country. 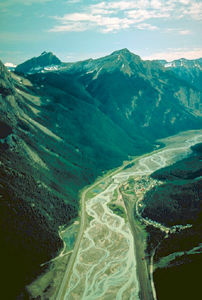 Despite Kicking Horse Pass’s severe inclines construction was completed in 1884.